This HP LaserJet Pro Printer can print at a speed of 20 pages per minute and has a duty cycle of around 8000 pages in a month. With 600x600 dpi resolution, you can get high-quality prints in lesser time. You can enable 35-page automatic document feeder that print variant-sized papers including A4, A5, envelopes and postcards. It features flatbed ADF scanner which scans with a resolution of 1200 dpi thus providing accurate and high quality scans. Moreover, it allows you to make 99 copies at a speed of 20 ppm with a resolution of 400x600 dpi. Now, you can get enhanced quality of copies, prints, or scans with this HP LaserJet Pro Printer. HP LaserJet Pro Printer comes with many inbuilt technologies that makes it reliable. You can easily set up and share with this printer by using Ethernet and wireless connectivity. With HP e-print app and software, you can connect it to mobile devices for wireless direct printing. Moreover, it also has AirPrint technology you can print from anywhere by using iPad, iPhone and iPod touch. You can also store all your documents with ease as it has an inbuilt memory of 128 MB. HP LaserJet Pro Printer has USB 2.0 port and Ethernet 10/100 Base TX network port which allows you to transfer documents at a high pace. The HP LaserJet Pro MFP M128fn Printer comes covered with 1-year manufacturer warranty. This affordable, full-featured MFP is easy to install—and prints, copies, scans, and faxes. Enable easy printing from smartphones, tablets, and laptops - at work, home, or on the go - with wireless connectivity and mobile printing features. Be agile easily manage your MFP right at the 3-inch colour touchscreen. Finish projects fast - use the 35-page automatic document feeder to make the most of your time. Easily copy both sides of a two-sided ID or other small document onto the front of a single-page. Set the pace for success with an MFP that prints, copies, and scans - fast. 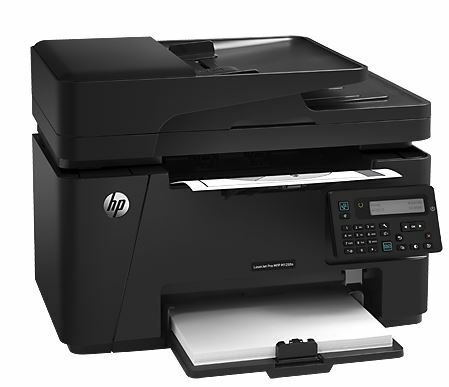 Click the button below to add the HP LaserJet Pro MFP M128fn Printer to your wish list.